If you type in “lipstick on a pig” in Google this morning, the link to Clarke’s book is the only entry you will find, for pages and pages, that doesn’t directly relate to the fainting-couch response to Obama’s recent use of the old phrase and the Obama-ite response to the false outrage. As I write this entry, I’m clicking on pages of Google entries generated by my use of the phrase in the search box. On page thirty-five (yes, the thirty-fifth screen of links) I’m sent to a blog called “Tennesse Guerilla Women.” “For someone who is famous for having a way with words, Barack Obama sure drops more than his share of sexist gaffes,” etc. Finally, halfway down the thirty-fifth page of links, I get to one Ken Conner attacking Planned Parenthood on OrthodoxyToday.org. His entry is called “Trying to Put Lipstick on a Pig” and here is his opening paragraph: Planned Parenthood is in search of a makeover. For years, the organization has been the biggest abortionist in the business, but as abortion is losing its cachet, Planned Parenthood is trying to reinvent itself. It seems that killing children for cash is just not as fashionable as it used to be. The whole debate about this middle-American idiom becomes, at least for me, more rather than less edifying as I scroll further down and away from the “direct” responses to the “issue.” I understand American culture and language more from its use on OrthodoxyToday.org and by the “I Like My Old Blackberry” crazies than from Chris Matthews whose Hardball last night was based on this absolute paradox: We are going to spend the whole show tonight talking about a false response to a non-issue that should not be an issue on our show. 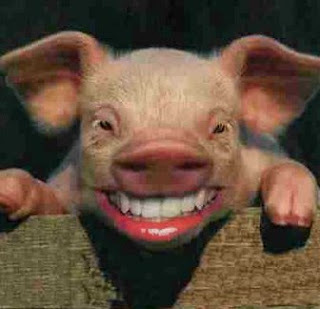 What if a lipsticked pig grunted in a forest and nobody came?